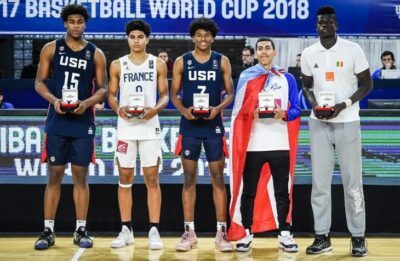 U17 may be a bit early to have a precise idea about the top prospects of a class but between a stacked Team USA who destroyed its opponents and a talented French squad, we will probably see many of them in a NBA jersey sooner or later. When a team wins all its games by 50, it’s hard to determine who the real prospects are among players who all have good stats. Yet, we decided to pick out five players from this team. Let’s start with the tournament’s MVP Jalen Green (6-5 SG 2001, 15.7pts). Green is a tremendous athlete with a non-stop motor. He shot a pretty good 34% from three, not bad for someone whose game could rely only on his athleticism. He has the potential to be a two-way star player in the League if he keeps working hard and is reminiscent of a young Kobe. Romeo Weems (6-7 F 2001) is a potential glue guy at both forward spots. Tough and athletic, he’s a very good defender and rebounder (8.1rbds 2.9stls 1.4blk). On offense, he’s a willing passer who needs to wwork on his outside shot. Evan Mobley (6-11 PF 2001) is your typical lanky pogo stick. Mobley averaged a team-best 2.6blks and 5.6rbds. He needs to work on his outside J and gain weight. Finally, Vernon Carey (6-9 PF/C 2001) and Isaiah Stewart (6-9 PF/C 2001) are typical bruisers who can play both inside positions. Like most of their teammates, they need to develop an outside J and are comparable to Jazz PF Derrick Favors. France could count on their Three Musketeers to reach the Final. Rising star Killian Hayes (6-4 SG/PG 2001) was selected into the All Tournament Team and averaged 16.1pts 3.6rbds 3.3as 2.7stls and 1.4blk. Hayes’ only bad game was against USA where the French combo struggled to score with 3/12FG. Malcolm Cazalon (6-6 SF 2001) was the best scorer for the French team (16.4pts) showing very good potential on the wing and sometimes playing the small ball four thanks to his length and athleticism. He’s also a good defender (4.4rbds 3stls) who, if he works on his outside shot, could develop into a prototypical 3 and D swingman. Theo Maledon (6-4 PG 2001) was the most poised of the three. He may not be the most athletic but averaged 6rbds per game to go with 4.1as. Yet, none of the three was able to be consistent from three, something they each have to work on to reach their full potential. Behind them, Crusol (6-3 PG/SG 2001) was the type of combo you need from the bench. He was very solid with 9.1pts 2.1as 1.4stl and 39% from three. We’ll see how he will develop in the coming years. Thanks to their own talented trio of outside players, Puerto Rico left Argentina with a bronze medal, their first medal in that competition. Curbelo Rodriguez (6-2 PG 2001) was the motor of this team. A complete and tough PG, he showed the way to his teammates and finished as the best passer of the tournament (5.9as). His shooting is major weakness with only 1/16 from three over the tournament. On the wings, San Antonio (6-4 SG 2001, 13.1pts 5.1rbds 2.3as) and Miranda Perez (6-4 SG 2001, 15.1pts 6.1rbds 2.4as 42% 3pt) were the perfect complement to make this team reach the semi-finals. Oumar Ballo (6-9 C 2001 Mali) was a beast inside for Mali. He doesn’t fit the modern big mold but with 20.6pts and 16.9rbds, he was unstoppable around the rim. Ask the Dominicans who could just watch Ballo go for 32pts and 32rbds against them. He’s not the most athletic player you will find so he will have to work on his conditioning and shooting from mid range. Roko Prkacin (6-7 SF 2002 Croatia) was one of the best all around players of the tournament (12.3pts 6.4rbds 1.9as 1.9blk 1.6stl) despite being one year younger than most players. He already has the size and skills you’re looking for in a versatile combo forward. His main weakness is his shooting as he shot only 42% FT. If he can improve that, he will become one of the top prospects his age in Europe. Kai Sotto (7-1 C 2002 Philippines) is now displaying his talent on a global level. We have already talked about the Philippines’ giant and he proved that his perfs in the Asian championship were no jokes. With 16.4pts 10.6rbds and a top 3 2.3blks per game, he was dominant against older players. Of course, he still has room to improve his strength and shooting, but this World Cup has turned into his international coming out party. Siriman Kanoute (5-10 PG 2001 Mali) was reminiscent of former Sixers’ star Allen Iverson. At 5-10, Kanoute was the best scorer of the tournament (24.6pts) and scored at will when driving to the rim with an arsenal of moves to finish. He needs to polish his game as he also forced a lot of shots, above all from three (26% with 14 attempts per game!!). He also had a lot of turnovers with 4.9tos per game, but he made up for it with 3.9as and 3.9stl. Jean Claudio Montero Berroa (6-1 PG 2003 Dominican Republic) was one of the youngest players of the tournament as he turned 15 just a week ago, yet he showed tremendous poise for the Dominican Republic. At 6-1, he only had one game under 12pts and was very consistent from the field with an averaged 44% FG including 39% from three. He also controls the ball very well with only 2.3tos in 33min while he stole more than 4 balls per game. Clearly someone to follow. Aleksej Pokusevski (6-11 PF/SF 2001 Serbia) has room to improve. The Olympiakos player struggled to finish inside with a poor 41% 2pt FG but was dominant on defense with 8.3rbds and 3blks per game in less than 20min. His skinny body type won’t help to gain weight but if he can get stronger and be a more consistent shooter, he could reach his potential.